August 16, 2018 August 16, 2018 by Margaret King . Posted in " News Releases " . Watch CBS News 8’s feature on Sally Ride Science Junior Academy as a program prepping young women for jobs that don’t yet but will soon exist. 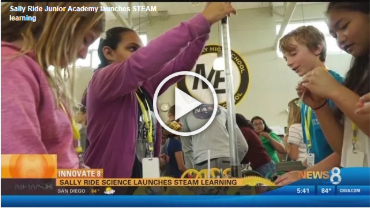 For more information on STEAM Education in San Diego, visit CBS News 8’s Innovate 8. August 13, 2018 August 15, 2018 by Chris LaPage . Posted in " In the Media, Video " . Tags " JUNIOR ACADEMY, Sally Ride, Sally Ride Science, STEAM, STEAM education " . August 2, 2018 September 13, 2018 by Margaret King . Posted in " News Releases " . Tags " Marine science, oceanography, STEAM, STEM " .